Major service town on the Manning River. Taree, a major service centre on the New South Wales Mid North Coast, is idyllically located at a point where the Manning River is wide and deep. The town is located 16 km from the mouth of the Manning River and it is surrounded by rich rural farmland where dairying, beef cattle and the timber industry still prosper. It is an ideal place to stop and take a leisurely walk along the river or have a picnic in the riverside parklands. Taree is located on the Manning River 313 km north-east of Sydney. The Biripai, Ngamba and Worimi Aborigines lived along the Manning River. It is likely that "tareebit" is the Biripai word for a fig tree common in the area. 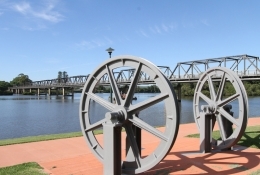 There is an excellent and detailed self-guided walk (it is downloadable at http://taree.cc/assets/Main-Site/Files/FP-Heritage/Taree-Heritage.pdf) which divides the town into a "Western Walk" and "Eastern Walk" and alerts the visitor to a total of 20 places of historic interest all of which are within two blocks of the Manning River. The total walk is around 5 km and usually takes around 2.5 hours. Fotheringham Park is a charming and interesting space which lies between the Manning River just north of Martin Bridge and Victoria Street. For years it was the natural place for travellers to take a break and enjoy views across the river. In 1988 a community project established a very unusual 'Herb and Sculpture Garden' with two sculptured and tiled posts and a range of interesting herbs which can be picked by locals. It is also the place where the town's War Memorial is located. The bridge took two years to complete. it was started in 1938 and completed in 1940. Named after the NSW Minister for Roads it replaced punts at both Taree and Tinonee. The bridge was built where, in 1834, William Wynter built the first ship, the brig Taree. Although not accessible to the public, Coocumbac Island is important environmentally. Like Wingham Brush Nature Reserve it is a small remnant of the now extremely rare lowland rainforest which once thrived on river floodplains. It is registered under the Threatened Species Conservation Act 1995. The Court House, built in an elegant Italianate style, was completed in 1882 and consists of the two-storey court room with single storey offices on either side. There is a small police station out the back. The Court House is particularly attractive because of the trees and shrubs which have been planted on either side of it. St Marys Catholic Church, part of a Catholic complex, was built in the 1930s to replace the original church which was constructed in the 1870s. The Presbytery was built in 1890. Recognised as the oldest building in town (and, therefore, the oldest church in town) is St Paul's Presbyterian Church which was completed in 1869 and is a typical Victorian Gothic Revival building. It is a rather simple building located in Albert Street. It stands incongruously surrounded by modern buildings. Built in 1899 this simple Victorian building is home to the Manning River Times which was first published in 1869. There is a remarkable concentration of churches on Albert Street and this impressive white and charcoal building was built in 1881 in the then-fashionable Gothic Revival style. The Taree Public School group of buildings dates from 1898 although a plaque outside explains that public education in Taree started in 1864. One of the most delightful ways of experiencing the Manning River around Taree (down river to Harrington and up river to Wingham) is to take a cruise on the Inland Explorer which is run by Manning Valley River Cruises and which departs from the Endeavour Wharf near Fotheringham Park. Contact (02) 6553 2683 for times and costs. A brochure can be downloaded at http://www.manningrivercruises.com.au/brochure.pdf. There are two impressive public sculptures in the heart of Taree. A huge, shiny abacus was installed in 2014 in front of the offices of Graham Brown GPB Partners, accountants in Victoria Street and a huge three metre goanna by Rick Reynolds is located on the sidewalk in Victoria Street. The ‘Big Oyster’ was officially opened by Nick Greiner, the Premier of New South Wales, in 1990. It was paid for by Louis and Attila Mokany who had also built the Big Prawn in Ballina and the Big Merino in Goulburn. Their plans were grandiose with the oyster being on the roof and underneath being given over to craft shops, the selling of fresh seafood, an educational display on the oyster industry in the local area, a service station and a Viennaworld Restaurant. It was a mammoth task to build. The sculptor James Martin, who had designed the Big Prawn, was commissioned and Glenn Industries, an Adelaide-based company, took three months to construct the 30 tonnes of steel, 70 tonnes of glass and reinforced fibreglass into an oyster which is 20 metres high, 27 metres wide and 20 metres long. It lasted only five years and closed in 1995. In 1999 it was purchased by Wally Spyschala and opened in 2000 as a car sales yard. The Big Oyster still sits on top of the car showroom. Cundletown is located on the Dawson River 13 km east of Taree. It is now effectively a suburb of Taree. There is a Cundletown Self-Guided Heritage Walk which is 4 km long, takes around 2 hours, and is detailed in a brochure (complete with a map) which is downloadable at http://taree.cc/assets/Main-Site/Files/FP-Heritage/Cundletown-Heritage.pdf. It has a total of 37 places of interest in the town. Many of the places listed are the locations of former residences and public buildings. However there are a number of extant, interesting buildings which have plaques outside which provide additional information. Cundleton has a strong connection with the poet Henry Kendall, famous for his poem 'Bellbirds' which generations of Australian schoolchildren learnt off by heart. Kendall lived in Cundleton from 1881-1882 and was employed as the local inspector of forests. He died of consumption in 1882. Kendall wrote about Taree in one of his poems. It is not one of his better poems. Kendall's connection with the town is commemorated by a monument in Kendall Reserve. Located 18 km south-east of Taree and only ten minutes from the Pacific Highway, Old Bar is the southern entrance to the Manning River. It was first discovered by Europeans when John Oxley passed through the area in 1818. It boasts an excellent surfing beach, good fishing in the estuary and attractive picnic locations beside the beach. To get there head south along the Pacific Highway for 4 km then turn left onto the signposted road which leads out to Old Bar. Check out http://visitmanningvalley.com.au/old-bar-manning-point/ for more information. Coopernook Forest Drive passes through the Coopernook, Lansdowne and Comboyne State Forests and follows the Stewarts River. It is well signposted and is suitable for 2WD vehicles in dry weather. The drive commences from the Forest Headquarters just north of Coopernook (26 km north-east of Taree). The route takes in Coopernook Forest Park, Vincents Lookout (330 metres above sea-level), Newbys Creek Walk, Newbys Lookout, Starrs Creek Picnic Area, Big Nellie Mountain (a 560 metre volcanic plug), Flat Rock Lookout (with a 500 m drop to the valley floor) and the modest Waitui Falls where there are swimming and picnicking facilities. To appreciate the beauty of the region check out its Facebook page - https://www.facebook.com/VisitManningValley/photos/?tab=album&album_id=554829354533271. * Prior to the arrival of Europeans the Biripai, Ngamba and Worimi Aborigines had lived in the area for thousands of years. * In 1770 Captain Cook sailed up the eastern coast of Australia and passed the mouth of the Manning River. * The first European explorer to cross the Manning River was John Oxley who explored the Manning Valley in 1818 and named the settlement of Harrington at the mouth of the river. * By 1824 the Manning River defined the northern boundary of the vast area of land (from Newcastle to Taree) which had been granted to the Australian Agricultural Company. * In 1829 Governor Darling declared the Manning River the northern limit of settlement in the colony of New South Wales. * Cedar cutters moved into the area in the late 1820s. * The first official land grant (a grant of 1037 ha) in the district was made to William Wynter in 1831. The modern township of Taree stands on this land. * Wynter gave his family home the name Tarree and subsequently named a schooner Tarree. * By 1854 William Wynter's son-in-law, a Scotsman named Henry Flett, had laid out a private town and was hoping that the town would develop into a major centre. This did not happen. The government preferred Wingham. * The local Presbyterian Church was completed in 1869. * Henry Flett's private town was incorporated into Taree when the municipality was declared in 1885. * The Court House was completed in 1897. * The railway arrived in 1913. This proved crucial to the development of the town as it gave Taree preference over Wingham. * A bridge, replacing the punt across the river, was completed in the 1940s. It was named Martin Bridge, was opened by the Minister for Public Works in 1940. At the time the Newcastle Herald reported: "This is the story of men who have to yawn or blow through their noses for 17 minutes before they begin their daily work; who have to wave their heads and legs and arms about and exercise all their joints for 38 minutes before they finish." The article went on to explain that the men who built the bridge had to work in air where the pressure was 35 pounds to the square inch and that the cylinders which formed the legs of the bridge were sunk to a depth of 70 feet. * By 1981 Taree had become a city. Manning Valley Visitors Information Centre, 21 Manning River Drive, Taree, tel: 1800 182 733. Open 9.00 am - 4.30 pm daily. There is a very detailed site at http://www.manningvalley.info which includes a series of excellent, downloadable Heritage Walks. 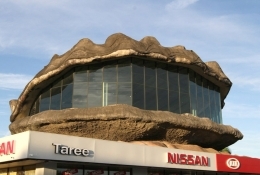 The Big Oyster - now on top of the local Nissan dealer. View down the Manning River with Martin Bridge and Coocumbac Island in the distance. The wheels that were originally installed on the Martin Bridge to raise the bridge for large vessels. Now part of the John Churton foreshore pathway. Fotheringham Park beside the Manning River. The War Memorial in Fotheringham Park. The main street of Taree. The giant goanna sculpture in Taree's main street. The Uniting Church, built in a Gothic style in 1881. St Paul's Presbyterian Church (1869) the oldest building in Taree. Our Lady of the Rosary (1930) replaced a church built in 1870. The Taree Court House (1882) with its three distinctive arches. The Anglican church of St John the Divine.